Note: this is an earlier version of my design; click here for a second attempt. "Nothing could be simpler. 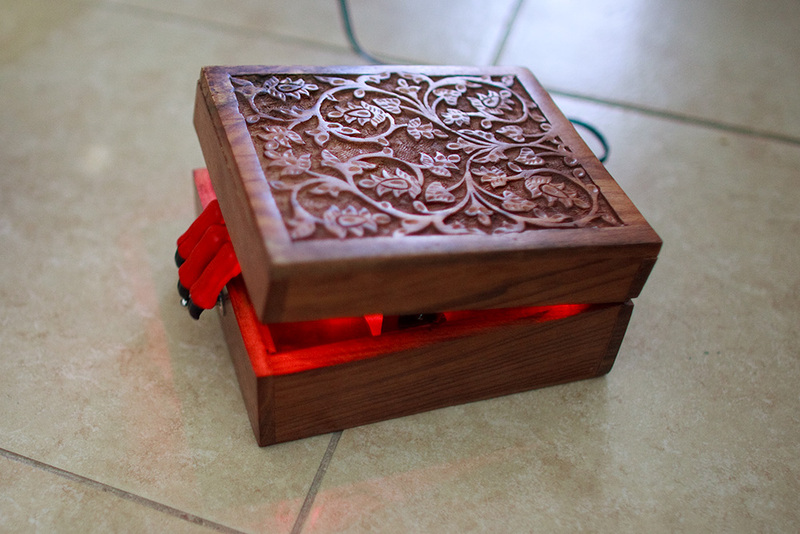 It is merely a small wooden casket, the size and shape of a cigar box, with a single switch on one face. When you throw the switch, there is an angry, purposeful buzzing. The lid slowly rises, and from beneath it emerges a hand. 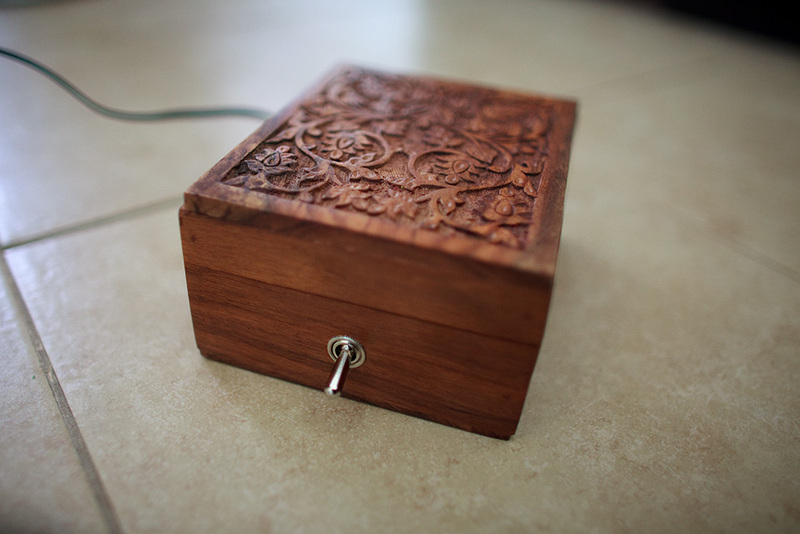 The hand reaches down, turns the switch off and retreats into the box. With the finality of a closing coffin, the lid snaps shut, the buzzing ceases and peace reigns once more. The psychological effect, if you do not know what to expect, is devastating. There is something unspeakably sinister about a machine that does nothing - absolutely nothing - except switch itself off." A video of the original design can be found here. Through the years, many hobbyists attempted to build their own variants, ranging from the literal to the outright gruesome; it only seemed fitting to also give it a try. In essence, I'm hoping to make the machine seem somewhat ominous and otherworldly, and respond with a motion more complex and more measured than typically attempted elsewhere. 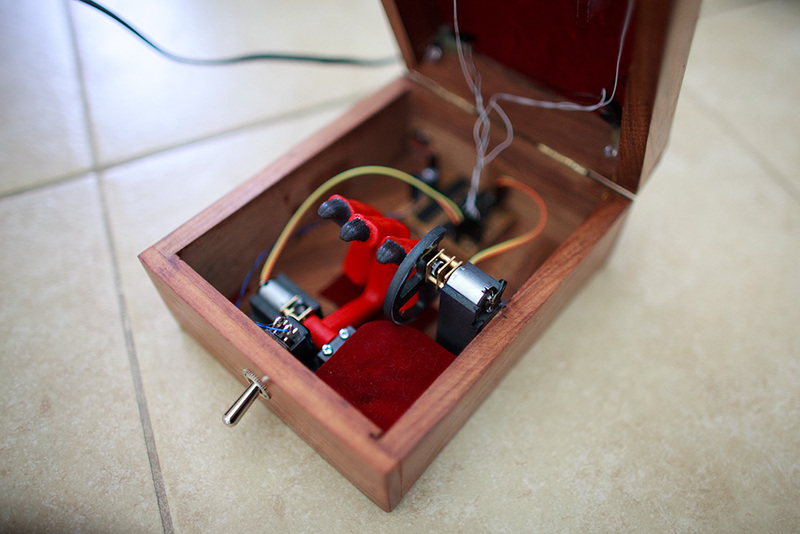 The centerpiece of my design is a cheap but ornate keepsake box (12.5 x 15.5 x 7.5 cm) purchased for $13 on Amazon - exactly the sort of a container to guard a timeless electromechanical secret. ...plus several resistors, capacitors, etc ($3.00). Most of these components were selected for their aesthetics or immediate availability alone, and can be substituted freely. On top of this, I made a couple other mechanical components by machining the geometry on Roland MDX-540 using RenShape 460, making rubber molds with ShinEtsu KE-1310ST, and then casting the final part in IPI IE-3075; if you are curious, click here for a detailed discussion of this process. Two gear motors, driven through a pair of FAN8082 H-bridge controllers. 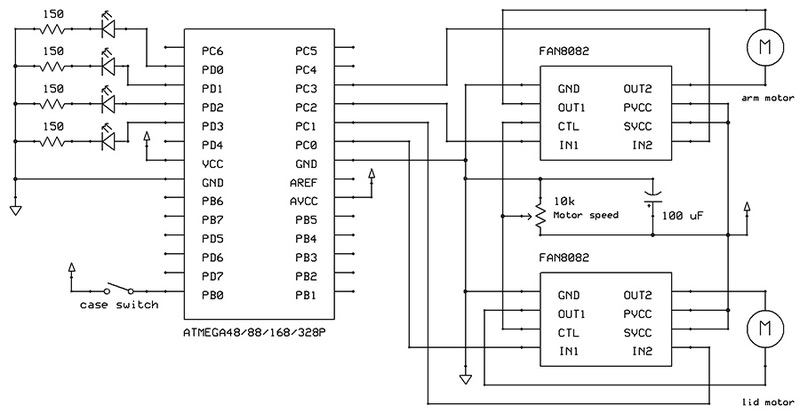 These chips are getting harder to find, but can be substituted with any other controller / driver - say TC4427CPA, TA7291P, BA6956AN, TA7267BP, L293D, and so forth. Four red, high-intensity, 20 mA LEDs - driven directly, as this is within the current sourcing capability of that particular MCU. Naturally, an additional transistor could be used with higher current LEDs, or when working with less featured mictocontrollers. I opted to power this with a 5V, 2A DC adapter. Strictly speaking, 1A could be sufficient (and costs 50% less): when operated at 5V, each of the motors has a stall current of about 0.6A, the LEDs need around 80 mA, and the microcontroller itself sinks under 5 mA - so as long as the motors are not operated simultaneously, there would be a reasonable reserve maintained. If previous step successful, go to 1, otherwise stop. Since the gear motors used in the project deliver around 20-50 RPM (depending on FAN8082 voltage setting) and a torque up to about 3,000 g/cm², the lid is actuated with a very simple assembly - essentially a cam - attached directly to the output shaft. The only two remaining bits of mechanical work involved drilling carefully positioned holes for the toggle switch and the DC power jack in the rear. You can see a crappy video of the box here.